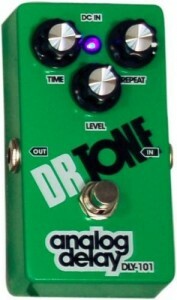 As the catalog of effects at Pedal Finder grows there are the pedals that garner more attention than others. These are the pedals that make the top ten list. It fluctuates and changes based on who’s visiting and viewing and right now the list is all over the board. Ranging from distortions and delays to boosts and volume pedals, it seems that visitors to Pedal Finder have a wide array of tastes. Yes, top ten lists are arbitrary (in a sense) and provide nothing more than a glimpse into who’s popular at a certain point in time, but just think about how interesting it will be when we look back at all the top ten lists over the years. That’ll be fun right? Forget it! Just check ’em out if you don’t already know about them or if just want to hear what others think. And by all means, take the time to review them if you do happen to have one of these in your lineup. Not only will you be helping out a fellow musician, but you’ll be gaining an entry into a future giveaway for each review you post. And, we do have a giveaway coming up just around the corner. Get a head start on that, because our next giveaway is going to be doozy!